DAWG GNAWS directly from the Source! 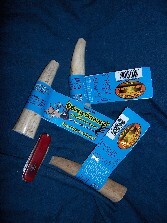 Antler Dog Chews Page: DAWG GNAWS individually labeled antler dog treats. SHIPPING: All retail chew orders over $75.00 ARE FREE UPS SHIPPING. Other orders may have fees and will receive guarenteed UPS flat rate shipping and handling for $9.95 PER BOX to street addresses only. We will ship your order immediately by United Parcel Service (UPS) without charge nor telephone call. NOTE: Some Dogs eagerly go after Dawg Gnaws™, others may not. To get a reluctant pet started, lightly coat a portion of the first antler chew with meat juices (i.e. bacon fat) or peanut butter and serve up on a hard, cleanable floor or on grass. CAUTION: Please supervise your pet as to his chewing behavior. CAUTION: Like for any chew toy or special dog snack, ALWAYS supervise your dog when giving DAWG GNAWS™ Do not allow them to try and swallow them or break them in half. These natural DAWG GNAWS™ are very hard and can break teeth if too aggressively chewed. If chewed too aggressively, or too quickly, remove chew and use later. Some dogs get overly possessive of dog DAWG GNAWS™. Always use caution when taking an antler chew bone away from your dog. A pint-sized ALL-NATURAL DOG CHEW! Available for FLAT RATE shipping! EXCELLENT Small-sized ALL-NATURAL DOG CHEW! MEDIUM DAWG GNAWS™ PREMIUM MEDIUM-sized Elk/Deer Hard Antler chews approximately ONE to ONE 1/2 inches in diameter and +/- SIX to EIGHT inches long. A great but Modest-sized ALL-NATURAL DOG CHEW! A wonderfully tasty Larger-sized ALL-NATURAL DOG CHEW! EXCELLENT JUMBO-sized ALL-NATURAL DOG CHEW! 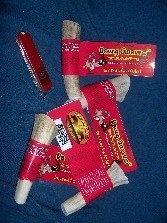 Dawg GnawsTM are Grande Natural Antler Company's (GNAC) new individually labeled antler dog chew product. Each antler chew piece has its own label which has a retail bar code and general antler mineral composition. Each piece has been individually cut by hand and then individually sanded to yield a premium dog antler chew product. 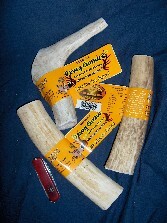 GNAC is full-time in the elk and deer business so we live antlers, we know antlers and we have the best selection, highest quality and freshest dog chew antler in the USA, From the smallest (Chihuahua) to the largest of dog chews (Jumbo or Mastiff) these are the best dog antler treats in the country. GNAC has created DAWG GNAWS to satisfy the public's demand for reasonably priced premium dog antler chews that have been closely inspected for safety for your pet. We acquire antler from all over the central US from the Rocky Mountain West to the mid-Western plains and even as far east as the Appalachian Mountains of Tennessee and Pennsylvania. Continually we seek out both farmed antler and natural antler drops, even rendezvousing with antler farmers and pickers where ever they might meet. 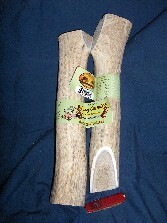 As you may have discovered, antler dog chews can have several grades of freshness and hence tastiness. We use predominately the freshest and largest of antler to make our antler chews for dogs, but do sometimes have older and small deer antler chews with its longer life and harder character for really aggressive antler chewing dogs. 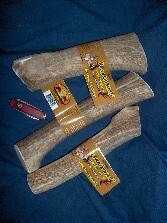 Always size your elk antler chew or deer antler chew to match your dogs weight. A larger dog should never have a small or Chihuahua sized antler chew stick. Avoid small pieces or broken pieces of antler which should be placed in the trash to avoid potential injury. Rarely, some DOG GNAWS™ may occasionally have some residual velvet antler skin and fur. This is not at all harmful in anyway. While usual on most dog ches, this fuzz is the natural skin and hair which formerly covered the antler chew. This is actually an extra treat for your dog, some dogs may actually prefer the more fuzzy ones! CAUTION: Like for any chew toy or special dog snack, ALWAYS supervise your dog when giving DAWG GNAWS™ Do not allow them to try and swallow them or break them in half. These all-natural DAWG GNAWS™ are very hard and can break teeth if too aggressively chewed. If chewed too aggressively, or too quickly, remove chew and re-introduce later. Some dogs get overly possessive of dog DAWG GNAWS™. Always use caution when taking an antler chew bone away from your dog. THIS WEBPAGE IS NEITHER AN OFFER TO SELL NOR A SOLICITATION TO BUY ANY PRODUCT IN ANY LEGAL JURISDICTION WHEREBY THE SALE OF SUCH A PRODUCT MAY BE ADVERSE TO LAW. NO ADVERTISED ITEM IS INTENDED FOR SALE IN THOSE AREAS WHERE LOCAL RESTRICTIONS MAY LIMIT OR PROHIBIT THE PURCHASE OR POSSESSION OF SUCH PRODUCTS. When buying our products you are purchasing those products here in Colorado where wild and farmed antler sales are legal. We then ship that personal product to you via UPS at your direction. The customer is responsible for their own state laws and local regulations in regards to buying and possessing wild and farmed antler.